THE EYESLICER, a new TV series and variety show collecting bold short-form work from the next generation of top American filmmakers, received its World Premiere at the 2017 Tribeca Film Festival in the Tribeca TV section. 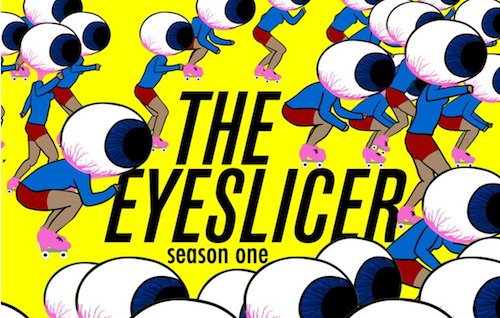 Collecting over 55 short films and commissioned pieces into ten cohesive hourlong episodes, THE EYESLICER season one provides a new path out into the world for daring short form content. THE EYESLICER is created by Dan Schoenbrun and Vanessa McDonnell (collective:unconscious). "The Eyeslicer Roadshow" kicks off in Baltimore at The Parkway Theater on 10/9, followed by Atlanta on 10/11 (Plaza Theater), New Orleans Film Festival on 10/14-16, Austin, Texas on 10/17 (Austin Film Society), Dallas, TX on 10/18 (The Texas Theater), Chicago, IL on 10/22 (Nightingale Theater), Cincinnati, OH on 10/23 (Mini Micro Cincinnati), Columbus, OH on 10/24 (Gateway Film Center), Denver Film Festival from 11/2-4, and Brooklyn, NY on 11/8 (the Nitehawk Cinema). A West Coast leg of the tour is in the works for early 2018. A limited edition box set of the first season featuring all ten episodes on a custom ‘sliced-eye’ hard drive and a bonus zine will be available as merch during the tour.Following this live roadshow, THE EYESLICER will begin an experimental invite-only secret digital broadcast, starting November 2. Partners, organizations, filmmakers, and super-fans will be given secret passwords that they can share with communities and friends. Viewers will need to track down a password to gain access. The first three episodes of THE EYESLICER will be released November 2, with new episodes following weekly through December 21st. “The whole idea behind THE EYESLICER has been to build a fan community for films that are proudly provocative, subversive, and strange,” said co-creator Vanessa McDonnell. “So we’ve come up with an online release strategy that's similarly left of the dial, and built a secret streaming platform broadcasting from an online bunker buried deep in the bowels of the internet.” THE EYESLICER will be broadcast athttp://www.eyeslicer.com/watch, with details about partnerships TK.